Bruno Kirby (born Bruno Giovanni Quidaciolu Jr.; April 28, 1949 – August 14, 2006) was an American actor, singer, voice artist, chef, and comedian. He was known for his roles in City Slickers, When Harry Met Sally..., Good Morning, Vietnam, The Godfather Part II, and Donnie Brasco. He voiced Reginald Stout in Stuart Little. Kirby was born Bruno Giovanni Quidaciolu Jr. in New York City on April 28, 1949. His father is Bruce Kirby (born Bruno Giovanni Quidaciolu). His brother John Kirby is an acting coach. Kirby attended Power Memorial Academy. Kirby was a popular character actor through the late 1980s and early 1990s. His film debut was in 1971's The Young Graduates. It was his role in The Godfather Part II as the young Peter Clemenza, that raised his profile in Hollywood. In the summer of 1972 Kirby, in one of his early television appearances, portrayed Anthony Girelli, the son of Richard Castellano's character Joe Girelli, in The Super; Castellano had played the older Pete Clemenza in The Godfather. Other television appearances include Room 222, and the pilot episode of M*A*S*H, portraying the character Boone (he has no lines). He also appeared in the 1974 Columbo episode "By Dawn's Early Light," alongside his father Bruce Kirby and in the season 2 episode "Seance" of Emergency!, where he was credited as "B. Kirby Jr."
Described by Leonard Maltin as the "quintessential New Yorker or cranky straight man", Kirby appeared in a series of comedies, typically playing fast-talking, belligerent, yet likable, characters. His best-known roles include a colleague of Albert Brooks' film editor in Modern Romance; a talkative limo driver in This Is Spinal Tap; the jealous, comedically impaired Lt. Hauk in Good Morning, Vietnam; and a shifty assistant to Marlon Brando—a parody of his Godfather role—in The Freshman. Kirby balanced comedies with dramatic roles like Donnie Brasco as a double-dealing mobster. Kirby appeared with Billy Crystal in When Harry Met Sally... (1989) and City Slickers (1991). Both featured Kirby's character as the opinionated best friend to Crystal's character. Kirby refused to sign on for City Slickers II: The Legend of Curly's Gold unless script changes were made and was subsequently replaced by Jon Lovitz. In 1991, Kirby made his Broadway debut when he replaced Kevin Spacey in Neil Simon's Lost in Yonkers. In the last decade of his life, Kirby had success in Stuart Little and was increasingly working in television. He starred as Barry Scheck in a 2000 CBS drama American Tragedy, played a paroled convict in a season three episode of Homicide: Life on the Street, and also directed an episode of that show. Kirby appeared on the HBO TV series Entourage - Season 3, episode 4 - "Guys and Doll". He portrayed the movie mogul Phil Rubinstein. Kirby, similar to his character in This Is Spinal Tap, was a fan of Frank Sinatra. He enjoyed playing softball in the late 1970s. He was also very allergic to horses and needed daily allergy shots on the set of City Slickers (part of the reason he declined to return for City Slickers II: The Legend of Curly's Gold) . Kirby was invited to be a member of the Actors Studio in 2006, less than six months before his death. Kirby married Lynn Sellers on September 29, 2003. He died August 14, 2006, from complications related to leukemia at the age of 57. ^ a b Associated Press (16 August 2006). 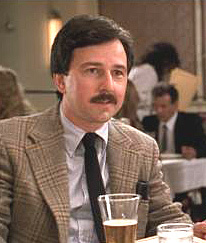 "Bruno Kirby dies at 57". today.com. Between the Lines is a 1977 film from Midwest Films directed by Joan Micklin Silver and produced by her husband Raphael D. Silver. The film won two out of the three awards it was nominated for at the 27th Berlin International Film Festival. Borderline is a 1980 American drama film directed by Jerrold Freedman and starring Charles Bronson, Ed Harris and Bruno Kirby. Bruce Kirby (born Bruno Giovanni Quidaciolu, April 24, 1928) is an American character actor. The film's screenplay was written by Lowell Ganz and Babaloo Mandel, and it was shot in New York City; New Mexico; Durango, Colorado; and Spain. A sequel City Slickers II: The Legend of Curly's Gold was released in 1994, with the same cast, with the exception of Kirby, who was replaced by Jon Lovitz. Donnie Brasco is a 1997 American crime drama film directed by Mike Newell, and starring Al Pacino and Johnny Depp. Michael Madsen, Bruno Kirby, James Russo, and Anne Heche appeared in supporting roles. The film is loosely based on the true story of Joseph D. Pistone (Depp), an FBI undercover agent who infiltrated the Mafia Bonanno crime family in New York City during the 1970s, under the alias Donnie Brasco. Brasco maneuvers his way into the confidence of an aging Mafia hitman, Lefty Ruggiero (Pacino), who vouches for him. As Donnie moves deeper into the Mafia, he realizes that not only is he crossing the line between federal agent and criminal, but also leading his friend Lefty to an almost certain death. It was nominated for an Academy Award for Best Adapted Screenplay. The adaptation of the book by Joseph D. Pistone and Richard Woodley was by screenwriter Paul Attanasio. The film was a box office success, earning $124.9 million against a $35 million budget, and receiving critical acclaim. Golden Gate is a 1994 American drama film produced by American Playhouse. Set in San Francisco, California, it tells the story of a 1950s G-Man (played by Matt Dillon) who ends up in the Federal Bureau of Investigation's Communist prosecutions, which leads him to become involved with a young Chinese American woman (played by Joan Chen) whose father he helped to put in prison. The film also features Bruno Kirby and Tzi Ma. The film is directed by John Madden and written by Asian American dramatist David Henry Hwang. The film is available on videocassette and DVD. Harrad Summer is a 1974 film sequel to The Harrad Experiment, directed by Steven Hilliard Stern. The film follows Harrad College students Stanley, Sheila, Harry, and Beth as they spend summer vacation together to get to know their families. Don Johnson and Bruno Kirby did not reprise their roles from the first film, while James Whitmore's character did not appear and Tippi Hedren's role from the original film was played by Emmaline Henry. Modern Romance is a 1981 American comedy film directed by and starring Albert Brooks, who also co-wrote the script with Monica Mcgowan Johnson. It co-stars Kathryn Harrold and Bruno Kirby. One Eyed King is an ensemble crime drama detailing the trials and tribulations of several characters living together in the same Hell's Kitchen neighborhood. Starring Armand Assante, William Baldwin, Jim Breuer, Bruno Kirby, Chazz Palminteri, and Jason Gedrick, the film had its premiere at the 2001 Boston Film Festival. Peter Clemenza is a fictional character appearing in Mario Puzo's novel The Godfather and two of the three films based on it. He is played by Academy Award-nominee Richard Castellano in Francis Ford Coppola's film adaptation of the novel, and by Bruno Kirby (as a young man) in The Godfather Part II. Sleepers is a 1996 American legal crime drama film written, produced, and directed by Barry Levinson, and based on Lorenzo Carcaterra's 1995 novel of the same name. The film stars Kevin Bacon, Jason Patric, Brad Pitt, Robert De Niro, Dustin Hoffman, Minnie Driver and Vittorio Gassman. Spy Games (History Is Made at Night) is a 1999 film directed by Ilkka Järvi-Laturi, and starring Bill Pullman, Irène Jacob, and Bruno Kirby. Written by Patrick Amos, the film is about a jaded CIA agent and a young and beautiful SVR agent fighting to save the world, their lives, and their secret love in post Cold War Helsinki. Filmed in Helsinki, Finland and New York City, the movie incorporates elements of romance, action, and thriller genres. The film premiered at the Toronto International Film Festival on 10 September 1999. Superdad is a 1973 American comedy film by Walt Disney Productions starring Bob Crane, Barbara Rush, Kurt Russell, Joe Flynn, and Kathleen Cody. Directed by Vincent McEveety, the film marks the motion picture debut of Bruno Kirby. The Basketball Diaries is a 1995 American View at an urban, American trainspotting, directed by Scott Kalvert, starring Leonardo DiCaprio, Lorraine Bracco, James Madio, and Mark Wahlberg. The film is an adaptation of Jim Carroll's autobiographical work of the same name, telling the story of Carroll's teenage years as a promising high school basketball player and writer who developed an addiction to heroin with his misguided friends. The Freshman is a 1990 American crime comedy film starring Marlon Brando and Matthew Broderick, in which Brando parodies his portrayal of Vito Corleone in The Godfather. It was written and directed by Andrew Bergman. The plot revolves around a young New York film student's entanglement in an illicit business of offering exotic and endangered animals as specialty food items, including his being tasked with delivering a Komodo dragon for this purpose. "The Gas Man" is the season finale of the third season of the American police drama television series Homicide: Life on the Street. It originally aired on NBC on May 5, 1995. The episode was written by Henry Bromell and directed by Barry Levinson. The episode focuses on characters played by guest stars Bruno Kirby and Richard Edson, with the detectives who normally serve as the protagonists here serving the function as secondary characters. The Young Graduates is a 1971 American drama film directed by Robert Anderson, and starring Patricia Wymer, Steven Stewart, Gary Rist, Bruno Kirby, Jennifer Ritt, Dennis Christopher and Marly Holiday. The film was released by Crown International Pictures on June 2, 1971. We're No Angels is a 1989 American comedy film directed by Neil Jordan and starring Robert De Niro, Sean Penn, and Demi Moore. It received mixed reviews and was a box office bomb grossing $10.5 million on a $20 million budget.